They're like tootsie pops; they look completely normal from the outside, but have a delicious surprise inside! Yes, I'm rebaking one of my favorite cupcakes which I made nearly two years ago. 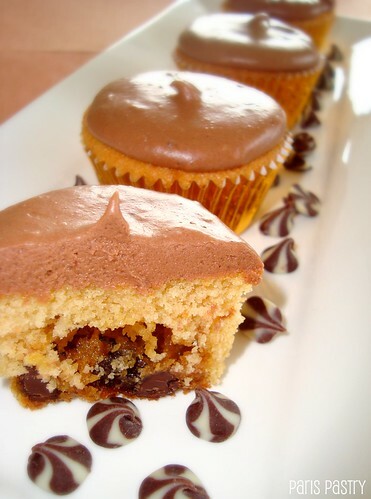 Like then, I used a brown sugar pound cake recipe for the cupcakes and topped them off with a chocolate frosting. As far as the cookie dough concerns, I don't recommend using your favorite chocolate chip cookies recipe because they might not work inside the cupcakes. As you see, my cookie dough recipe doesn't call for baking soda, baking powder nor eggs, which makes them not own up much space within the cupcake when baking. Rating: 4 out of 5. - In a large bowl, combine the flour and the salt. Set aside. - In a large bowl, cream the butter with the sugars until smooth, about 3 minutes. Add the vanilla and the water and mix well. Add the flour mixture and beat thoroughly. Stir in the chocolate chips. - Make a flat disc out of the cookie dough, wrap it in plastic and store in refrigerator for at least 30 minutes. - Get on with the cupcakes. When ready to use again, break the cookie dough the size of a tablespoon and roll the cookie dough into a ball. - Preheat the oven to 325˚F. In a medium bowl, sift together the flour, baking powder and salt; set aside. - In the bowl of an electric mixer fitted with the paddle attachment, beat butter and sugar on medium speed until light and fluffy, 2 to 3 minutes, scraping down the sides of the bowl as needed. Add eggs one at a time, beating until combined. - Add the reserved flour mixture in two batches, alternating with the buttermilk; beat until combined. 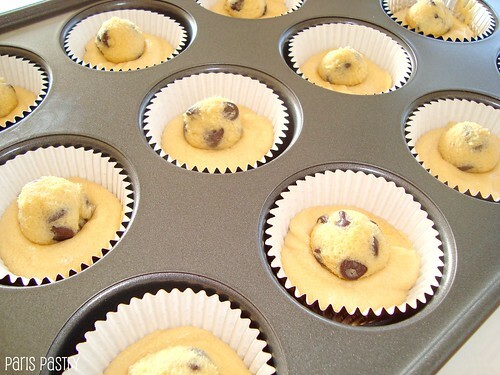 Line a cupcake pan with cupcake liners and fill each cupcake case half full (when making chocolate chip cookie dough cupcakes). 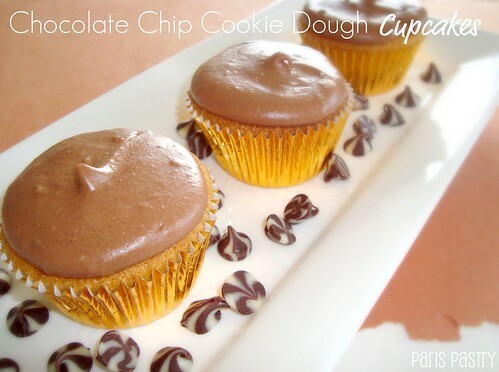 - Bake until cupcakes are golden brown, for 20 - 25 minutes. Leave cupcakes in pan to cool for 10 minutes, then turn out and let them cool completely on a wire rack. oooh, these look fantastic! I love cupcakes that have the little surprise inside! These look delicious and they are so unusual - I would definitely like to make some! What a great idea! The actual cupcake batter looks as delicious as the filling! You come up with such wonderfully delicious recipes! You are not helping my cause (i.e. need to loose ten pounds for a vacay to Punta Cana) at all!!! OMG they look so good! Omigod, those looks so heavenly. Chocolate chip cookie dough makes everything better!